It has a pretty, textured design with an interesting and new-to-me stitch technique. The k1 long entails putting your needle in between two stitches that are two rows below your needle and pulling up a “long” stitch. Fun and keeps the knitting interesting. …but I quickly realized, when I tried it on, that it was not going to work. There were big, open gaps between the buttons! And those buttons were a little more daring. 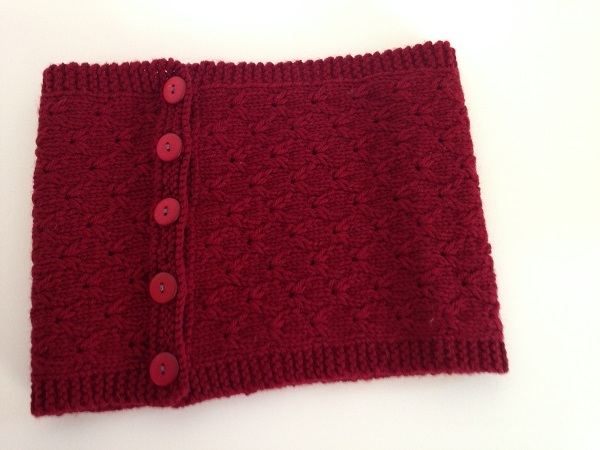 My prototype had the buttonholes at the end (luckily), so I took it back and re-knit the design with 6 buttonholes. I looks much better! 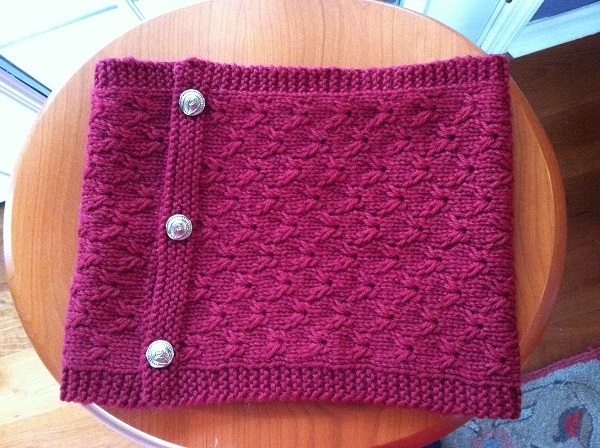 Knit with worsted weight yarn (I used Cascade 220), this can also be made longer to make an infinity cowl. It is knit flat so you can make it any length you want! If you are interested in purchasing this pattern, you can use the “buy now” button below and it will take you to Ravelry. P.S. In case you are wondering, I did NOT knit this recently because I’m not supposed to be knitting much these days! I knit this last year and got stalled with the button issue. If you know me, you know that I tend to have a little motivational trouble when it comes to sewing on buttons and I was somewhat discouraged about needing to fix the gap issue, which meant adding more buttons. More. But, clearly I overcame and persevered! 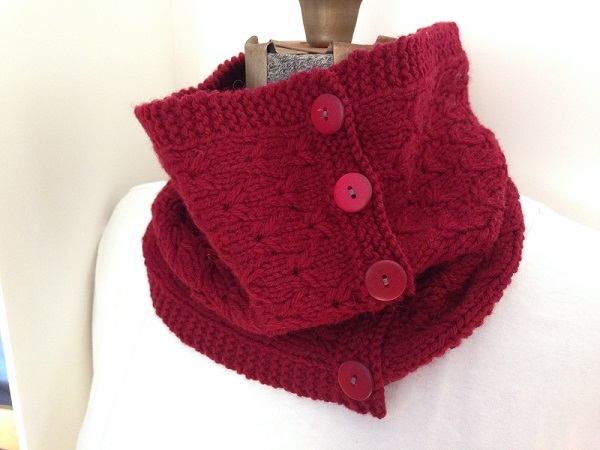 Posted in Uncategorized and tagged buttoned cowl on February 24, 2017 by lizytish. Very pretty texture. Great tips to ensure success. Looks like a great pattern, Liz. Very pretty pattern, Liz. And great tips. Saw it in the shop yesterday…very lovely indeed.